Anyone in business selling products or services have probably tried many ways to attract traffic to their websites. This includes via hits from the various search engines. ‘Page Rank’ particularly from the Google algorithm are impacted by various paid strategies. These include Pay Per Click (PPC) campaigns and social media campaigns via sites such as Facebook and other social media marketing. Local businesses need to also consider getting a ‘Google My Business’ entry. The search giant introduced this free service in 2016 for businesses of all sizes including bricks-and-mortar and home-based operations. Its purpose is to aid businesses to setup direct connections with their potential customers. Why Use Google My Business? This free product allows searchers to see your business information shown in the right-sidebar next to the usual search results on the left. Done correctly the information shown allows quick and easy access to your business. Via phone, Google+ or location map as well as linking to your website. You also have the opportunity of providing answers to frequently asked questions and display customer reviews to enhance your credibility and build trust. It’s really about staking your claim as the business owner and making your key contact information highly visible and easy to act upon. Displays key business information. This includes your physical business address, products and services description, photos, open-for-business hours, website URL and contact numbers. Improved search visibility. As Google is the search engine with the largest user base, displaying your business info in the search results is great for drawing attention and attracting traffic. Google Maps integration. For bricks-and-mortar businesses, being pinned on Google Maps gives your credibility a big bump and a competitive advantage if your competitors have not cottoned-on yet. Works great on smart devices. Designed to be fully responsive on mobile phones and tablets, Google My Business displays all the info available from the desktop version but also includes a click-to-call button to make it even easier for people to contact you while out and about. Encourages comments and reviews. Social proof is extremely valuable so Google My Business enables your customers to submit responses that you can control via a dashboard (need to log in). How do I get this going? Step1 – Open a Google Account. Most likely you already have an account (Gmail, Google Analytics, Google+ etc) but if you don’t – follow the ‘Get on Google‘ instructions. Step2 – Build your Business Profile. Once signed-in, you are redirected to a Google map on which you are asked to search for your business to see if it exists. Type your business name or address into the search box. If no exact result is returned, you will need to add your business manually by clicking on the link displayed. Included here will be questions about ‘delivering goods’. If you are a home-based business and don’t want your private address shown, select the option that relates to ‘Deliver Goods at Customer’s location’ and enter postcodes or distance radius your business services. Step3 – Verify your business. To make sure only authentic business owners submit entries Google require verification. 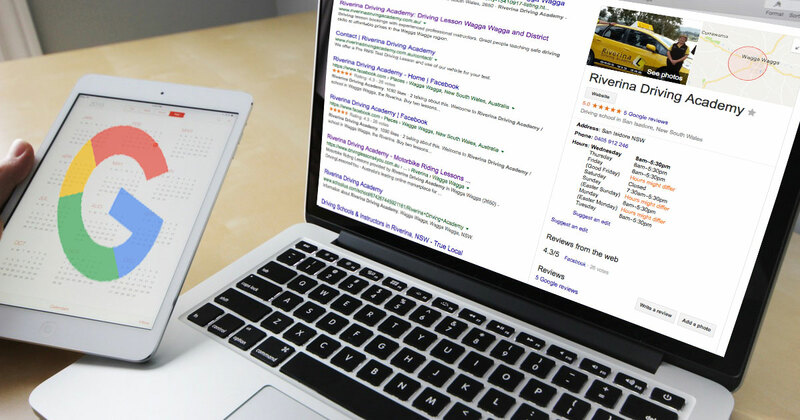 Verification helps ensure the accuracy of your business information across Google. Verified businesses are twice as likely to be considered reputable by users. Verification also protects you from anyone who might otherwise pose as a representative of your business. Until you’ve completed verification, you won’t be able to edit the business information that appears on Google products. For most businesses, verification means requesting, receiving, and reading a verification postcard (physical card in the post) from Google or perhaps a phone call from Google to make sure there’s a real person behind the business. Step4 – Add Information to Your Profile. Write a concise but meaningful description of your business (products/services). Fill in your hours of business for each day of the week. Add the URL of your website. Provide some professional-looking images that ‘sell your business’. Consider getting help from a pro-photographer if you don’t already have good images. Start with one if that’s all you have but remember you can add more images later. That’s it . . . but it’s not a case of set-and-forget. Just like your website you need to make sure the information is kept up-to-date. Updates can be made from your desktop or mobile device at any time you are online. There’s even an option to update via an app that is downloadable for the Apple Store or Google Play. Need help with your Google My Business listing? Appearing professional in the search results is great but don’t forget that your business website is still your ‘home on the internet’. We can show you how to integrate Google My Business on your site so you can display all the comments and reviews to build your social proof and encourage more customers to take up your offerings.